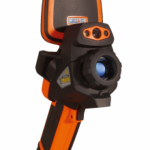 From the moment I picked up the FLIR C2 I proclaimed (to myself) that this was the future of thermal imaging. Super slim and weighing just 130 grams; compact enough to fit in your top pocket, rubberised all over and not a button in sight (except for the on-off switch). First impressions were futuristic and definitely smart-phone-like. In fact even the packaging was reminiscent of my last iPhone. The packaging is certainly very smart and makes a good first impression. The entire product follows the same distinctive style and quality. Flir C2 packaging is styles very similar to modern era smart phones. Very stylish. Getting down to the basics I put the unit on charge. I am pleasantly surprised that it uses a standard USB Micro B cable (just as my Samsung smartphone) rather than using a proprietary connection. This is a very convenient connection for me. I utilise the same cable to effortlessly connect to my PC and download my images. 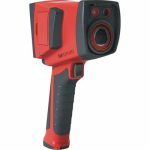 The standard JPG format is easily viewable in the windows environment and for post processing and access to the 14-bit data files (radiometric data, visual image etc) I can open them in the FLIR tools software. The internal memory is more than sufficient with a claimed 500 sets of image storage. The start-up time is impressively quick. My rough count has it at around 10-12 seconds before you have a useable image. This is not usually a matter of importance for a professional camera as once you power it on it’s likely to stay on for several hours. However this platform definitely favours the more casual user who will want to perform a “spot” or “quick check” so convenience is a must. Flir C2 image of 240V electrical distribution board. Distance approx 0.5m showing a rather blurred image of switchboard. Resolution is insufficient to identify individual conductors or even components. Flir C2 Image with MSX. MSX strokes the image with an outline function that is taken from the visual camera. It then overlays this visual component over the thermal image to give the impression of greater resolution. In real terms we are just witnessing an enhancement in the visual component, not the thermal. Comparison of the Testo 875-1i showing same doorway. We were experimenting with draft control, hence the cardboard. The industry trend to go to these ultra wide angles is almost entirely about cost cutting. The wider the angle, the smaller the optic and the lower the cost. Additionally when using such wide angles you can get away with a fixed focal length removing the need for a focus mechanism, further reducing costs. 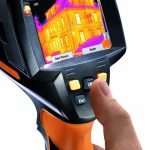 Reducing the cost is no doubt an important and strategic element to this camera as FLIR have created an unprecedented market price breakthrough at below $1000. This will certainly see volumes sold unlike no other. I was surprised to see a thermal sensitivity at 100mk (0.1°C) and it certainly translates in the image. This is quite a respectable value. 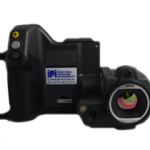 As with all FLIR units the FLIR C2 is outfitted with MSX. Like a broken record I will repeat how unimpressed I am with image blending technologies and for those who want to know why they can read my comments here. Thankfully, the image mode allows MSX to be turned off so that you can see a genuine thermal image without any visual distortions. 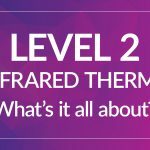 The visual image can also be selected separately and when saving an image the FLIR C2 will automatically save both thermal and visual images simultaneously. The visual image at 640×480 is not brilliant, but certainly sufficiently matched to the thermal resolution. I must keep coming back to the architecture, which beyond image quality is the most enduring aspect of this camera. Despite being slim, the smartphone design is familiar and comfortable in the hand. Completely encapsulated in soft rubber, the camera has a positive and sturdy feel and at no time feels like it’s going to slip or fumble from my hands (it also comes with lanyard). The touch screen is responsive and intuitive, crisp and clear. 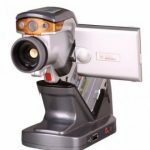 For those not familiar with FLIR icon system it won’t take long to work out. By touching anywhere on the screen 6 graphic based menu icons appear giving access to the image playback menu, Image mode, measurement mode, colour palette, lamp and settings menu. Icon based menu function appears across the bottom of the screen. Featured from left to right: image playback, image mode, measurement mode, colour palette, lamp, settings. Yes, surprisingly this unit includes a lamp function which can be set to manual or auto which is ideal for low light situations. This is very impressive for such an entry level model. The Flir C2 also supports 4 colour palettes, arguably the most important including iron, rainbow, rainbow high contrast and grey scale. For such a slim and compact unit I am impressed to see battery run time of 2 hours. Beyond the predictable image quality, there’s not a lot to fault with the design of this unit. There is no lens cap or cover for the lens and despite being recessed into the body it could still suffer from accidental contact. 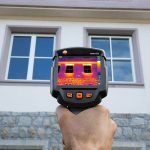 In its current form the features are light, but this platform has plenty of potential to reshape the way we think about thermal imaging.